Febrile seizures are seizures that happen in children between the ages of 6 months and 5 years, that is associated with high fever but with an absence of intracranial infection, metabolic conditions, or previous history of febrile seizures. It is subdivided into 2 classifications: A simple febrile seizure is brief, isolated, and generalized while a complex febrile seizure is prolonged (duration of more than 15 minutes), focal (occurs in one part of the brain), or multiple (occurs more than once within 24 hours). Febrile seizures most often occur within 24 hours of the onset of a fever and can be the first indication that a child is sick. Symptoms may include a high fever (102°F to 104°F [38.9°C to 40°C]), sudden loss of consciousness, eye rolling, involuntary moaning, crying, and passing of urine, rigid (stiff) limbs, apnea or jerky movements on one side of the body (such as arm and leg). 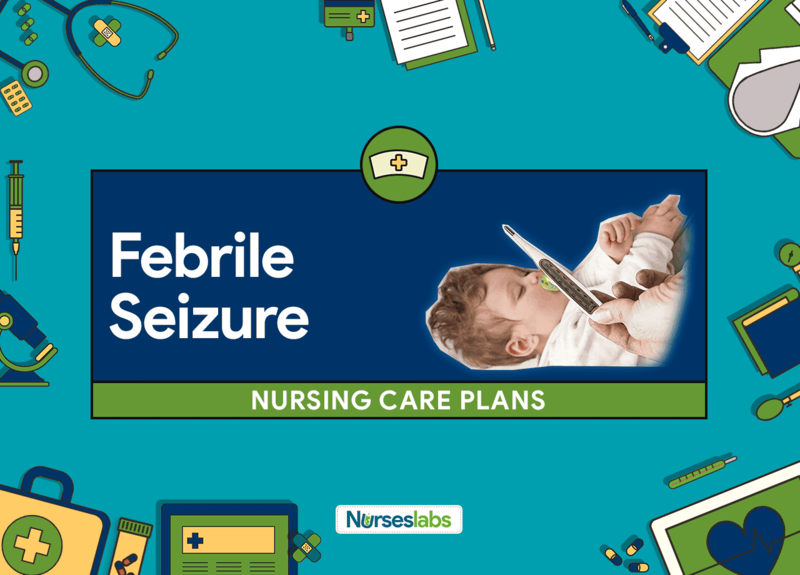 Nursing goals for a child experiencing febrile seizures include maintain airway/respiratory function, maintain normal core temperature, protection from injury, and provide family information about disease process, prognosis, and treatment needs. Ineffective Airway Clearance: Inability to clear secretions or obstructions from the respiratory tract to maintain a clear airway. Child will maintain a patent airway. Assess the child’s airway patency using the look, listen and feel approach. This will ensure that seizure does not affect the supply of oxygenated blood to the brain and prevent the development of hypoxia. Auscultate lungs for the presence of normal or adventitious breath sounds. Abnormal breath sounds can be heard as fluid and mucus accumulate. This may indicate airway is obstructed. Place the child on a flat surface then turn the head on the side during a seizure episode. Turning the child’s head to the side helps in maintaining a patent airway by promoting drainage of secretions and avoid aspirations to the lungs. Loosen any restrictive clothing, especially on the neck, chest, and abdomen. This will facilitate ease of breathing and maintain an unobstructed airway. Suction secretions gently as indicated. Suctioning will eliminate secretions and decreases the possibility of aspiration. Provide supplemental oxygenation as indicated. Oxygen therapy is prescribed to improve oxygen saturation and reduce possible complications. Prepare for/assist with possible intubation as indicated. Extended apnea episodes after a seizure may require a need for ventilatory support.